Guagán Barra / Guag na Barra (“Barra’s mountain retreat”), known in English as Gouganbarra / Gougane Barra, is a place of rare beauty and tranquility, with the still, sacred atmosphere of a great natural cathedral. Sheer 370m red sandstone cliffs overlook the tiny lake isle where C6th Saint Finbarr fasted and meditated, also founding a monastery after he had expelled the legendary monster of the lough. The ruins visible today date from C18th Penal Law days, when the remote valley was a popular place for the illegal celebration of Mass. The Celtic Revival oratory (1902) on the island is a good venue for small weddings, as it is only big enough for the happy couple, the celebrant and two or three others. The small cemetery nearby contains the grave of Timothy O’Leary, the subject of Eric Cross‘s book The Tailor and Ansty, which caused a furore on its publication in 1942. The Gougane Barra Hotel is a gem, whether for afternoon tea, a bar lunch, a full dinner, an overnight stay or a longer sojourn. It caters mainly for walkers, but also has a small theatre. 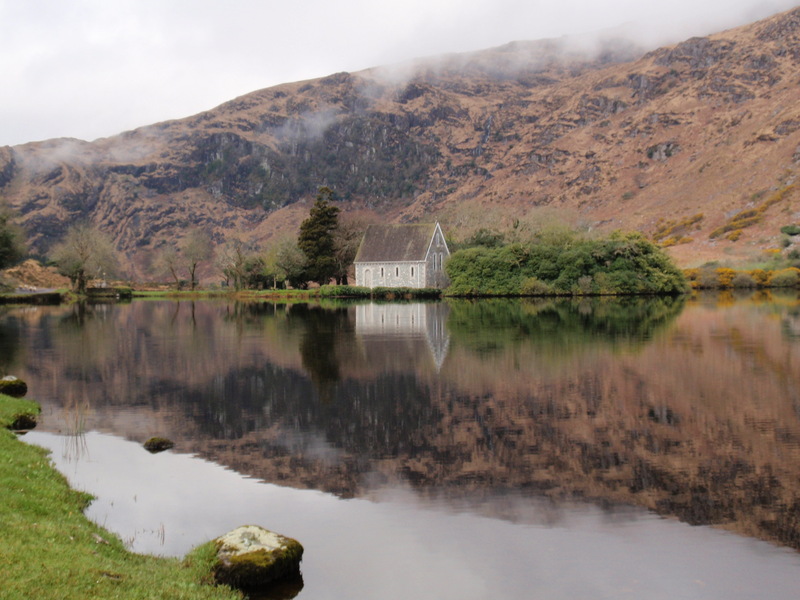 Gougane Barra National Forest Park, acquired for forestry plantation in 1938, opened as a National Park in the 1960s and now run by Coillte, occupies 350 acres in and around the Coomroe / Com Rua (Red Coum / Hollow) glen separating the Derrynasaggart and Sheehy mountain ranges. Irish stoats, pine martens and pygmy shrews inhabit the valley floor, while falcons and ravens patrol the rocky slopes. The mature trees include one of the finest stands of Sitka spruce in the country, reaching 38m in height. The forest has a scenic “motor trail” and several well-marked hiking routes, including the Slí Laoi to the source of the River Lee and part of the Gougane Barra Horseshoe. Béal an Ghleanna / The Mouth of the Glen was the site of the first engagement of the War of Independence, when local IRA recruits ambushed an RIC party. The Battle of Keimaneigh / Cath Chéim an Fhia in January 1822 was a skirmish between Crown forces and revolting peasants called Rockites (a version of the Whiteboys). In addition to the three locals killed, one participant, Edward Ring, was hanged with five other accused found guilty at Cork Assizes of involvement in similar skirmishes around Muskerry and Duhallow. A Corkonian called Walter Lane blamed the peasant violence on a “presence of want caused by the low price of agricultural produce and the failure of the potato crop, not to political or religious feeling.” Hmm. Kealkill is a small friendly village with none of the airs or trappings of popular tourist venues, set in a charming and unspoilt part of the picturesque Ouvane River valley in the Caha Hills. The pubs in the locality are hospitable and entertaining, often hosting lively music sessions. Cyclists and walkers can enjoy the local network of minor roads offering circuit routes of varying distances. On Sunday mornings villagers practise Road Bowling (Kealkill recently hosted the All Ireland Championships). Other traditional local pursuits include basketry craft at Maughanasilly, candle making at Derryfada and woodcraft at Maulavaning and Cappabue, in addition to salmon and trout fishing. There is also the exciting possibility of coming across a poitín still. The Kealkill Valley is the biggest of the Three Valleys stretching from Keimaneigh to Ballylickey on Bantry Bay. The Kealkill Stone Circle is a significant archaeological site, with not only a Stone Circle but also a radial stone cairn and a pair of Standing Stones. After Dermot’s death in 1548 there was a leadership struggle resulting in a territorial division between Donal Cam O’Sullivan of Dunboy and his cousin Sir Owen O’Sullivan, who each occupied Carriganass Castle at different times. Sir Owen was on the victorious English side at the Battle of Kinsale on 24th December 1601. Afterwards Donal Cam abducted the knight’s wife and had her held captive on Dursey Island, where she died in the infamous 1602 massacre. The Revenge of Donal Cam recounts the legendary story of how Donal Cam, disguised as a monk, avenged the murder of his own wife, Aoife, by the English commander St. Leger, whose subsequent wedding to the daughter of a local MacCarthy chieftain was being celebrated in Carriganass. After 1602 the castle came into the possession of the Barrett family, who remained in residence until 1930. The ruin is one of the biggest Daubenton bat roosts in Ireland. Signposted walks to the north of the castle link up with the Beara Breifne Greenway, the route taken by Donal Cam on his disastrous Retreat to Leitrim. Lake Toureen is the location of the interesting Maughanasilly Stone Row, 5 sandstone uprights aligned northeast / southwest over 6m, dating roughly from c.1500 BC. Kilmocomoge is the site of a ruined church dedicated to Saint Mocomoge, an atmospheric old cemetery, a Holy Well and souterrains. The Mealagh River Valley, widely considered one of the most beautiful areas of West Cork, has so far escaped significant development. The valley contains several interesting archaeological sites. Just below the valley on the Bantry road are the ruins of Castledonovan / O’Donovan Castle (1560) and a mound of rocks signifying the tribal seat. Like the nearby Borlin Valley, the Mealagh gives its name to a traditional polka jig / set dance. Kealkill is linked via the Cousane Gap to Dunmanway on ByRoute 3. Coomhulla Bridge, spanning the Coomhola River, is the nearest thing to an urban centre for the scattered community of Coomhola, overlooking Bantry Bay. There is a charming little church nearby. Coomhola Lodge, built in the late C19th as a hunting lodge for the Earl of Bantry, has exceptionally lovely gardens, cascading streams, native woodlands and wildflower meadows. It is available for self-catering holiday rental, and is suitable for groups. There are smaller self-catering options in the area. The Priest’s Leap, a mountain ridge on the Cork / Kerry border, is accessible by a scenic road skirting the beautiful valley of Cúm na Léime. The Coomhola / Kealnine Valley area is very attractive, and provides access to Knockboy / Cnoc Baoi, the highest peak in County Cork, and the exceptionally scenic Borlin Valley. Coomhulla Bridge, the western terminus of ByRoute 4, is close to Glengarriff on the Bantry Bay stretch of ByRoute 1, and linked via the Borlin Valley to Kilgarvan on ByRoute 5.